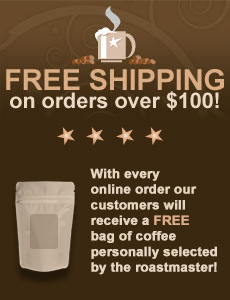 Every online order- Every online order will receive a free bag of coffee selected by the roastmaster as a thank you. This offer will continue into 2020. Evening Star Coffee Roasters presents “No BS Brew Company” & “Rising Storm Brewing Company”- We have partnered with the best! Both companies are featuring our locally roasted coffee in their newest creations of perfection! NO BS Brewing is serving “Coffee Porter” and Rising Storm Brewing Company is serving “Before Dawn” coffee stout. Please visit these two companies locally in Livonia, NY to meet the owners who are not only talented, but are great people! 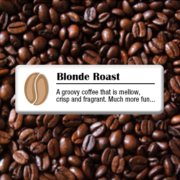 Looking for a fundraiser– Our coffee fundraiser earns the selling group $4.75 per 12oz. bag of coffee sold. We have no minimum orders so if you sell 300 bags great. If you only sell 20, that is fine too. ESCR will be closed from 4/10-4/21. No orders will be processed during this timeframe. 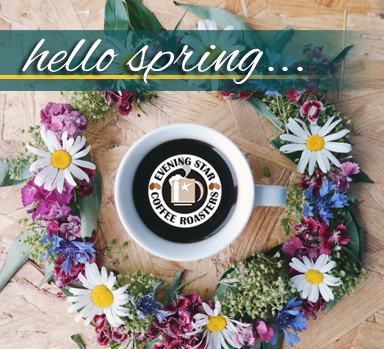 Evening Star Coffee Roasters is committed to providing the freshest, most exceptional Arabica coffee beans from the world’s finest coffee-producing countries. We pride ourselves on hand selecting these green coffee beans as thousands are available at a variety of quality levels. In our coffee offerings, we carry coffees that are hand selected from individual farms. Our selection process has a positive impact on the environment, people, and wildlife in the countries in which they have been harvested. Our coffees are roasted in the town of Avon which is located in the Finger Lakes Region. We use a unique style of roasting to fully enhance the distinctive qualities of each specialty coffee bean. Our roasting profiles combined with our small batch, hands on roasting techniques guarantees an even roast every time. The result is the coffee beans unique flavor and aroma characteristics are successfully brought out of the bean and into your cup. We are an advocate of charities in the communities we serve. We are proud to support the life changing work of these wonderful charities. These organizations make a difference in the lives of people in the community. Our hope is that our example will inspire others to make a difference in their communities, thus having a positive impact on the world. 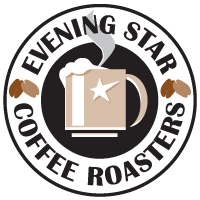 Evening Star Coffee Roasters strongly supports environmentally friendly activities in our local communities. We feel it is our global responsibility to demonstrate green-friendly thinking in every aspect of our business. This is demonstrated in our packaging, facility design, and vehicles used for deliveries. Our goal is to create awareness and promote responsible actions on the part of everyone that lives on this wonderful planet. We make it our commitment to change the world, one cup at a time!